Oh wow, how time flies so fast! It’s already the holiday season and in many parts of the world, Christmas is such a big thing. Ornaments light up the streets, carols fill the air, and people scramble around to get presents for their family and friends. For a delightful time like this, The Root of All Travel can’t help but join the merriments. In my own little way, I would like to take part in the Christmas spirit by running The Root of All Presents - a special holiday giveaway for you as my way to say thank you to all of you who have shown me support this past year! All you have to do is sign-up on the giveaway page below with your active email address and you’re in - that simple! Nothing complicated. But wait, there’s more! On top of that, you also earn extra entries by visiting and following The Root of All Travel and my generous friends on Facebook and Instagram, visiting our websites or watching their videos. Finally, I am also giving you the chance to earn even more entries by referring your family and friends to join the giveaway as well. The more people you refer, the more entries you get. It’s definitely a win-win! The chilly weather of the season makes me want to lounge around and a good staycation is something I really do appreciate. That’s why for this giveaway, we are giving away an overnight stay for two at the Savoy Hotel Manila. Avgeeks prepare as The Runway Suite boasts of a sweeping view of the airport runway and a perfect vantage point to watch the glorious Manila sunset. Located at the Newport City, this 35-square-meter corner room is stocked with premium amenities for every type of traveler, which is just a stone’s throw away from the Ninoy Aquino International Airport Terminal 3. Upon arrival, you will be greeted with welcome drinks at the Zabana Bar by the warm and friendly staff of Savoy Manila. You will also enjoy not just a comfy stay but also a complimentary buffet breakfast at the Savoy Café, access to the co-working space – The Squares, and use of the hotel gym equipped with locker rooms, steam room and sauna. And of course, a staycation would not be complete without a dip in the swimming pool. I know many of you have been wanting for a luggage giveaway for the longest time. And the timing could not have been more perfect for the holiday season. One winner will take home a Delsey Segur luggage – one of Delsey’s best-selling luggage item combining innovation and streamlined design. Segur sports a durable design with a completely detachable and washable lining – perfect for the meticulous travelers out there. On top of that, you will never have to worry again about your luggage being broken into with the patented Zip SecuriTech. Hopping from one city to the next should be easy and worry-free. This luggage will definitely be a perfect companion to your next trip whether domestic or international. I own a trusty Delsey luggage myself and I can attest to the durability and functionality the brand provides – not to mention the contemporary look of each line. Truly, the brand name alone just speaks for itself. Been dreaming of that ultimate Euro trip to visit the Eiffel Tower and the Venetian canals? Or been wanting to chase the Northern Lights in Ireland? How about gazing at the fascinating hot air balloons hovering over Cappadocia? 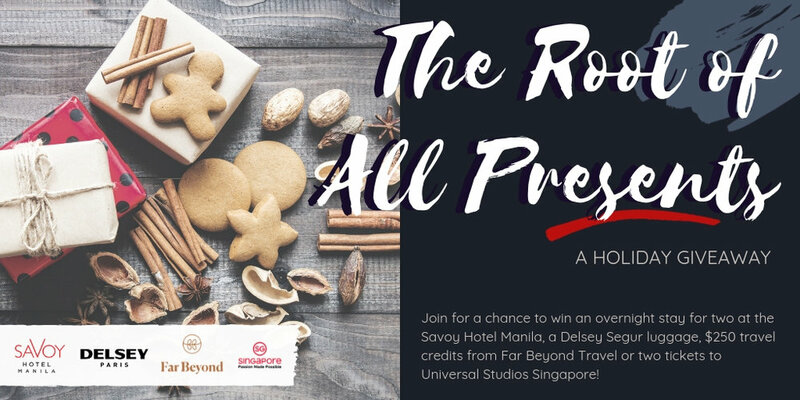 Fulfill your travel goals now with Far Beyond Travel and the USD250 travel credits* we are giving one lucky winner. That’s approximately PHP13,300 at the time of publish! Far Beyond Travel is an up-and-coming travel company offering travel packages around the world! Europe? Check! New Zealand Check! Japan and Korea? Check and check! And so much more destinations! From the Dubai desserts to the snowy streets of Hokkaido, they got you covered. On top of the private and bespoke tours, they also offer other travel services such as booking butler, visa processing, and itinerary planning. This is such a perfect way to minimize the stress of planning your bucket list trip yet still getting that personalized touch on your itinerary. *Travel credits may only be used for travel packages and may be redeemed until 2023. Unleash your inner daredevil through the inversions of the Battlestar Galactica at the Universal Studios Singapore with the two tickets* we are giving away courtesy of the Singapore Tourism Board. More than what people expect, the small city-state Singapore has so much thrill in its DNA. While it’s a good starting point, the Transformers 3D Ride and other extreme rides at the Universal Studios Singapore barely scratches the surface of hair-raising adventures Singapore offers. There’s the gravity-defying iFly, the famous zipline over Sentosa, and the heart-pounding GX-5 Extreme Swing at Clarke Quay. On top of that, Singapore hosts a number of adrenaline-pumping sports events such as the Grand Prix and number of marathons year after year. *Tickets are transferable and are valid until 11 February 2019. Contest closed. Thanks to all who participated!